Holden ends the novel by refusing to say what happened after the carousel other than that he got sick and was sent to the rest home he currently occupies. He mentions that a psychoanalyst asked him if he'll apply himself when he returns to a new school in the fall. Holden says he thinks so, but adds that you won't know what you're going to do until you do it. The end of Catcher in the Rye is ambiguous. Holden is still evasive, and still refuses to commit to applying himself, but his flexibility about what he's going to do may hint that he's growing up and his adolescent rage is lessening. In fact, Holden says that he now wishes that he hadn't talked so much about what happened to him, and wishes he'd said less to D.B., who often comes to visit him. Holden advises readers not to tell their own stories, because it will just make them miss everyone they tell about. He even misses Ackley and Stradlater now. More ambiguity: is Holden's wish he hadn't talked about his story continued evasion? Is missing people a sign he's giving up his alienating hatred of others? Holden has always been contradictory and independent. His path from here is up to him. Kestler, Justin. "The Catcher in the Rye Chapter 26." LitCharts. LitCharts LLC, 22 Jul 2013. Web. 9 Nov 2018. Kestler, Justin. "The Catcher in the Rye Chapter 26." LitCharts LLC, July 22, 2013. 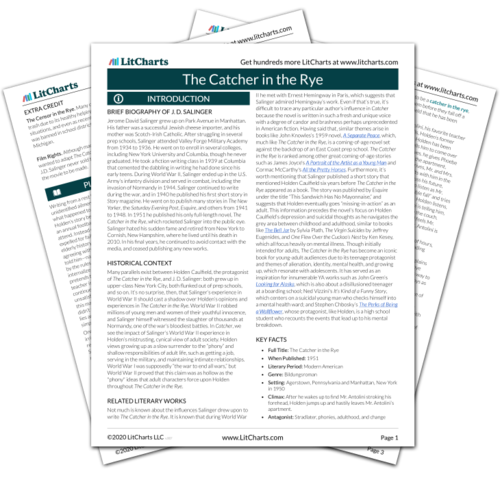 Retrieved November 9, 2018. https://www.litcharts.com/lit/the-catcher-in-the-rye/chapter-26.